If you are anything like me, you most likely took a fork to the brownie pan yesterday. You were amped. There was a sugar-mania in which you scrubbed your shower and your entire bathroom area. Jeez, you are efficient! You started laundry. By the time the dryer beeped you developed a case of what I like to refer to as “the sugar sweats.” Your feverish mania starts to break. You start to crash. Things get real. You need a nap. You know you did it to yourself. Those brownies deserved it. It’s the holidays. You take the laundry out. You start by folding all the towels. Gosh, that laundry is warm. Maybe you will just lay in it for a minute. You wake up thirty minutes later in a pile of clean laundry. Your cat is on your chest, looking pleased with herself. You realize you left your puppy in the living room with your Christmas tree…oy. If you are anything like me, today you need to eat a whole bunch of kale and drink a whole bunch of water. Lately, (when I am not shoving brownies down my gullet) I cannot get enough kale in my body. I suppose there could be worse addictions. I have recently discovered the magic that happens when you wilt these beautiful greens in the oven. Not quite raw, not quite kale chips. The heat draws out their natural salt, and the spines get soft and easy to eat. It takes ten minutes, and is a very easy way to gobble up a whole bunch of yummy greens. This is not a meal that will leave you face down in a pile of warm laundry. Promise. Wash, dry and chop your kale. I just happened to use a bag of Trader Joe’s curly leaf kale that was already washed and prepped. Yay! I recommend those bags. Place your kale on a baking sheet and drizzle with olive oil. Lightly salt the leaves. Massage the kale with your hands in order to distribute the oil and salt evenly. Bake your kale at 350 for 10 minutes, or until the kale is gently wilted. You do not want it to be as crispy as kale chips. Although, kale chips are totally delicious. While your kale is getting its wilt on, heat a pan over low heat. Add your walnuts and your coconut to the pan. Lightly toast them. Both your coconut and your walnuts will become fragrant as the oils are released, and they will both get some light color. 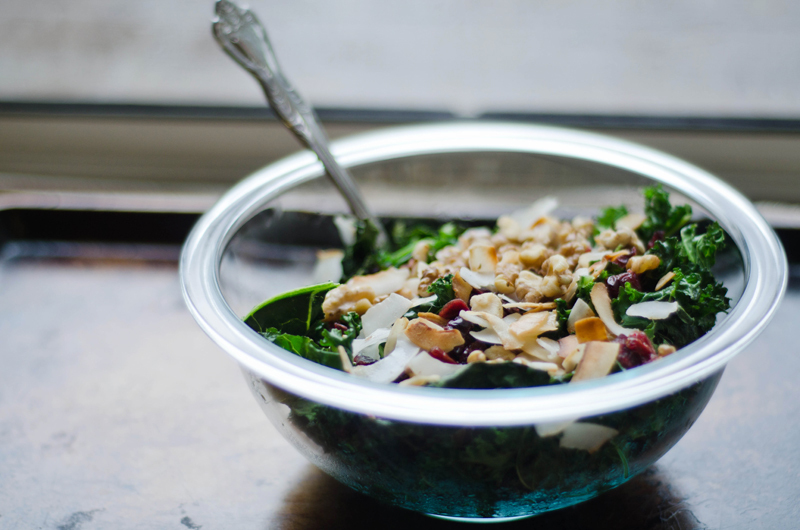 Once you kale is out of the oven, add it to a bowl. 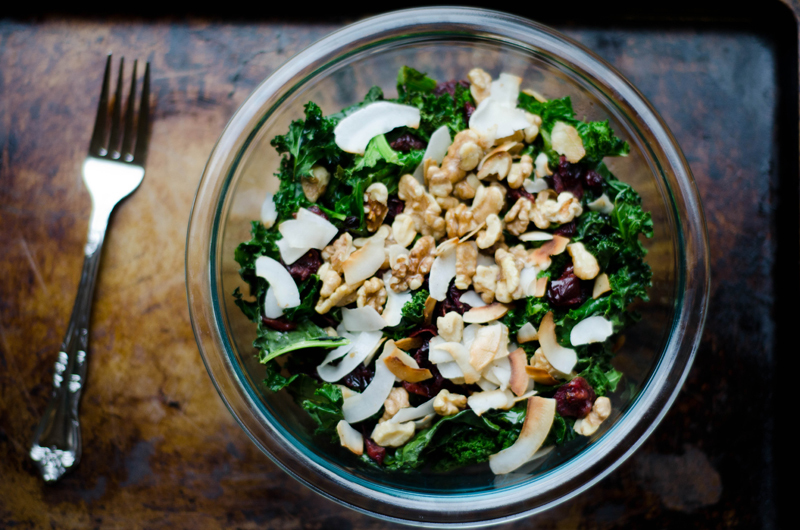 Top your kale with the coconut and walnut mixture. Add in your cranberries. Lightly drizzle a little olive oil over the top. This looks very yummy and healthy! I’ll have to give it a try. I need to try to eat more greens but since my husband about has a panic attack when he sees them on his dinner plate they get left out of meals all too often. haha! Oh, no! Do you have to be sneaky about it? Unfortunately, kale is a little harder to disguise. Ok, this is totally my kind of salad and your photos are kick*** . It resembles a salad that Heidi Swanson made that I have been wanting to try for some time. I love that Traders has washed and ready to go kale. Thanks for the tip. Sometimes I can spend 40 minutes washing, drying, de-stemming and prepping kale for the week. I have been eating too many sweets as well lately, it’s the time of year though! We’ll all be back to our normal eating routines come January. Detox time! Thanks for the compliment, Jackie! You are too kind. I LOVE Heidi. 101 Cookbooks is my jam. It was one of the first food blogs I was ever into. I love how as a non-vegetarian she can make vegetarian food look so satisfying and beautiful. I love this for Christmas dinner! Thanks for sharing! 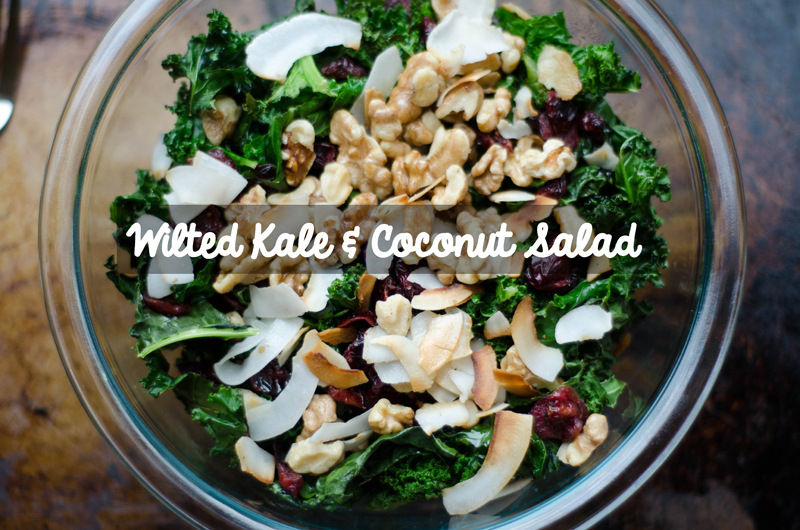 The kale/coconut salad looks wonderfully delish! As I am embarking on a hefty goal in 2013, finding good, healthy and easy food dishes is a blessing! Since I’ll be watching my grams of fat intake, I’ll most likely “mist” the olive oil, rather than drizzle (I’m a heavy handed drizzler!). Going to the store to get the ingredients today after work! Between you and Becca over at http://www.thedabblist.com/ you make my life easy! Also, the lovely Becca (and Tim too) bought me a Breville juicer (I cried I was so surprised/happy by this gift! ), so I am gathering any and all juicing reciepes! Love your blog!